Technology is a relatively new addition within the wealth management industry, from robo-advisors to AI-enabled chatbots. However, the need for human financial advice will not be pushed to the side any time soon, says GlobalData, a leading data and analytics company. 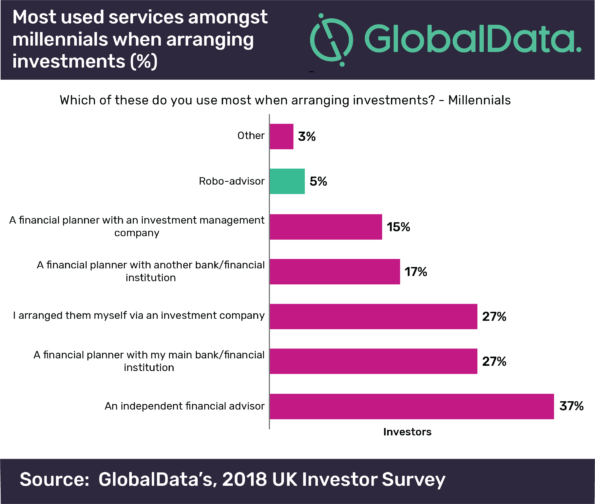 According to GlobalData’s recent ‘UK Investors Survey’, face-to-face communication, amongst millennials, still reigns supreme when arranging the buying and selling of investments. Of the most used services millennials choose when arranging investments 95% of them sill involves human interaction and expertise with only 5% involving solely robo-advisors. Traditional wealth managers have experienced multiple recessions and periods of market volatility, proving they are able to weather a storm and with a potential market downturn on the horizon, robo-advisors may not be ready to tackle the risks to client investments that come with it.